If a non-miltary affiliated person would like access to JBER-Richardson Training areas only, they will need to visit one of the two front gate visitor's centers and obtain an AF Form 75 for the day. Without an AF Form 75 access to JBER will be denied. All persons wishing to access JBER must meet secruity forces requirement for installation access, weapons restrictions and registration, vehicle entry, cellphone use, etc. If you have questions regarding installation access requirements, see the Security Forces personnel at the Visitor's Centers or call 552-5420. Before attempting to access the base you must first register in the iSportsman system, then pay for a recreational pass. This can be done on this website or at a kiosk located at the JBER-Richardson Visitor Center. To gain access to the base, non-military affiliated (civilian) persons are required to to obtain a base visitor's pass at the JBER-Richardson front gate Visitor Center. If you have questions regarding installation access requirements, see the Security Forces personnel at the Visitor's Centers or call 552-5420. 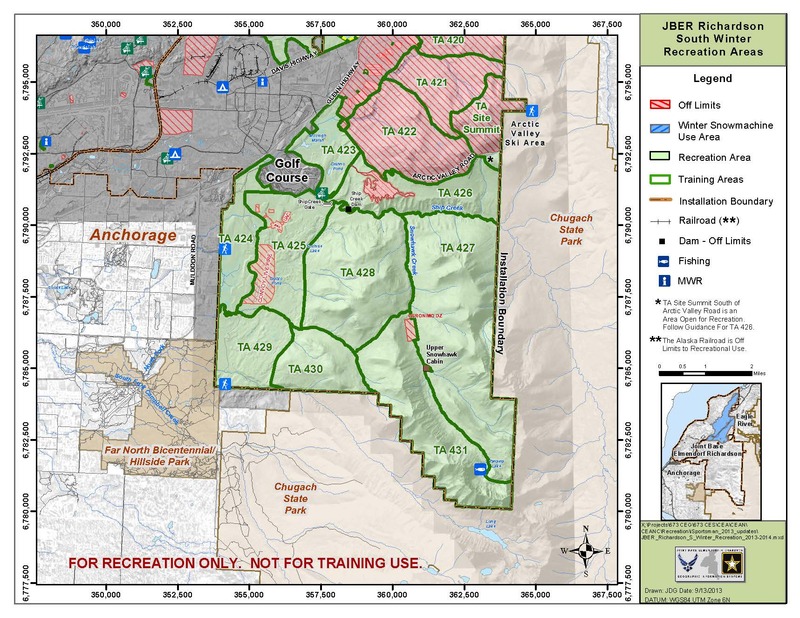 Non-military affiliated persons are only authorized to recreate in JBER-Richardson Training Areas (TAs) currently open to recreation (current openings can be found here). Keep in mind that there are areas that are permanently closed to recreation and it is your responsibility to be aware of them. Non-military affiliated persons are not authorized on JBER-Elmendorf or the developeted portions of JBER (including but not limited to Six Mile lake and Otter Lake) unless accompanied by a military-affiliated sponsor. Recreational hours for non-affiliated persons are limited to 0600-2300 (6:00am - 11:00pm). To see recreational opportunities maps, see below. Before recreating you must first register in the iSportsman system, then pay for a recreational pass. This can be done on this website or at kiosks located at either JBER Visitor Center. If you have questions regarding installation access requirements, see the Security Forces personnel at the Visitor's Centers or call 552-5420. Military affiliated persons are authorized to recreated in all JBER areas currently open to recreation (current openings can be found here). Keep in mind that there are areas that are permanently closed to recreation and it is your responsibility to be aware of them. JBER-Ricahardson Training Areas (TA) are open from 0600-2300 (6:00am - 11:00pm). Authorized recreational users recreating past midnight in the restricted access areas (e.g. formerly Elmendorf Air Force Base, Otter Lake, Six Mile Lake, and all areas not designated as a TA) must sign out prior to midnight and then sign back in after midnight. By using the iSportsman system to recreate on JBER you are agreeing to the Hold Harmless Agreement. Click HERE to read the agreement. Recreational use of the installation is secondary to military training. Recreational users must follow area open/closure guidance. 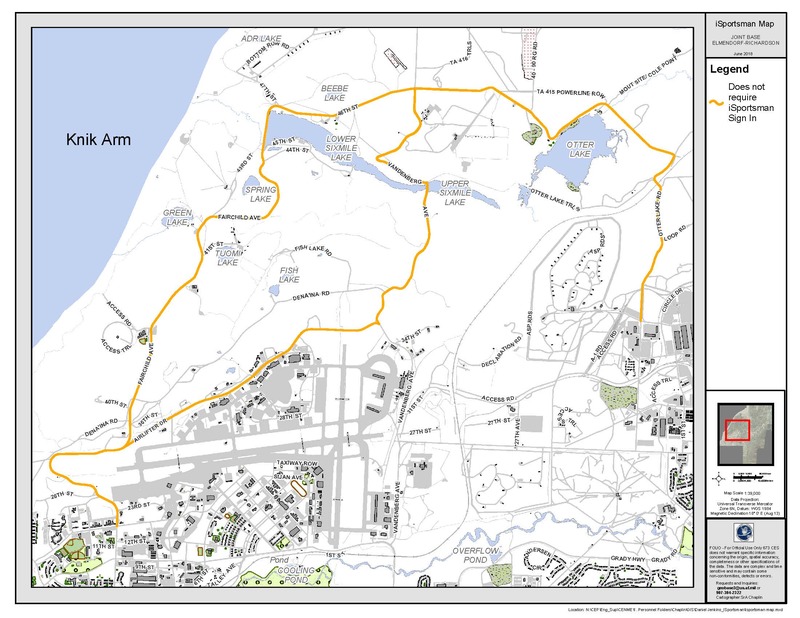 Training areas (TA) are updated by Range Control; only open training areas will be available for recreation. A JBER Recreation Permit (iSportsman Permit) is required of anyone age 16 years or older who will be recreating on JBER. Visitors under the age of 16 must be signed in as guests of and accompanied by an authorized permit holder at all times. Permits and a government issued photo I.D. must be carried on your person at all times. After you have completed registration and purchased your Recreation Permit, click on the above 'Sign-in/Sign-out' link to sign-in to open training areas. You can sign in and out from any computer with internet access, from any smartphone, or at either of the two iSportsman kiosks located at the main Richardson and Elmendorf gates. You can also sign-in and out by calling toll free: 855-703-9176 or 907-202-5091. All recreators must sign-out when they are done. If visitors fail to sign-out, authorities will assume that the visitors are still in the training areas and possibly in danger and/or in need of assistance and will proceed to initiate a search; actions which could result in loss of recreational access privileges. For the purposes of recreational use of JBER, visitors are defined as personnel TDY or those visiting friends or family for 30 days or less from outside Alaska. Visitors may recreate without an iSportsman permit ONLY while accompanied by an individual that is authorized to recreate on JBER and is properly signed in to the iSportsman system. Visitors may recreate in the training areas unaccompanied if they obtain their own iSportsman permit and properly sign in and out of the system. The US Government will not be liable for any damage or injury to equipment, persons, or property resulting from the use or participation in any recreational activity on JBER lands. Anyone who engages in recreational and natural resource harvesting activities, do so completely at their own risk. Recreational users and those harvesting natural resources are financially liable for damage to government or private property resulting from their activities. By accessing this website on any computer or smartphone. Just go to the 'Sign In/Out' tab.